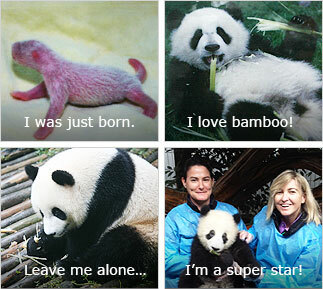 Follow our private panda tours to Chengdu, you can see newly-born babies, naughty cubs, and cute adults in the research base. Dujiangyan and Bifeng Gorge near Chengdu are the only two bases in China that offer featured volunteer program. But the program that allows tourists to take photos hugging a panda is still suspended in Bifeng Gorge. At present Dujiangyan is the only choice for panda volunteer program. If you have no time to drop by Chengdu, we offer a selection of classic vacation plans for you to see this adorable creature in the zoo. Seeing the Great Wall, Terracotta Warriors and giant pandas, your China tour would be perfect! There are only less than 2,000 pandas living in the wild or in captivity, accurately 1,864 reported in 2015, among which 1,367 are living in Sichuan. Bamboo takes 99% of their diet, but not their only food. They also have some meat, cereal, vegetable, fruits, and some prefer sweets. They defecate 40 times a day! Due to the high-fiber bamboo diet, their excrement is clean. Some souvenirs are made from the excrement, and some cubs even eat the excrement of their mother. All of the world's pandas come from China! This animal was first known by the westerners in 1869, when a French missionary was given a black-and-white fur. One of the reasons why the World Wildlife Fund for Nature (WWF) chooses the image of giant panda to be the logo is to reduce the cost of printing - only black and white are needed. Every Year, the United States pay one million dollars for renting pandas to stay in the zoos in Atlanta, Washington, San Diego, and Memphis. When a cub is born in a foreign country, it will be immediately escorted to China by FedEx. There are only two or three days a year when the female pandas are in heat, but some do not know how to mate. Human help is necessary for their breeding. Newly-born cubs are like small pink mice, weighing only three to five ounces; however, they will grow to 100 pounds within one year, and become adults (over 300 pounds) in five years. It has the sixth 'finger' on each of its paws. This 'thumb' beside the five fingers can help it firmly hold the bamboo, and climb the tree. They have tails. An adult has a fluffy white tail with a length of 8 inches (20cm). Clinging to the plump hip, the tail is hard to be noticed. i will be visiting chengdu in end of March and plan to visit panda centre, is it possible to take pictures and play with the Pandas in Dujiangyan Panda Base? Hi, the panda volunteer reservation should be made in advance. I visited the panda base last year and made the reservation about two months beforehand. I do not know if you can make it possible just half a month in advance. Anyway, you should contact the base as soon as possible. Good luck. could someone clarify what each of the areas have to see - the gorge, the safari park and the panda base? If you do not intend to hold pandas and have a limited time, I would suggest you go to visit the Chengdu Research Base of Giant Panda Breeding. It is the nearest one from the city and also one of the most visited places. However, if you would like to hold pandas or even do panda keeper program, then Dujiangyan Panda Base is recommended. In regard to the Bifengxia Base, as I know, it is closed for renovation now. So you may visit one of the above two bases according to your own needs. Is Chengdu Research Base of Giant Panda Breeding open on 1-2 May? Do I have to make a reservation in advance to make a photo with panda? How can I do that (via web)? 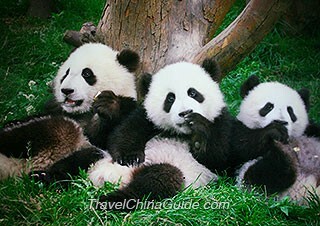 The panda base is open on May holiday, but the site will be very crowded with lots of travelers during holiday. As I know, now the service for holding a panda to take photos are only available at Dujiangyan Panda Base, you can not do it at Chengdu Research Base of Giant Panda Breeding. You may call them at 86-28-83510033 or send them an email to pandabase panda.org.cn for more information. Thank you, Lesley, for your reply! How to contact Panda Valley? Hello I'm trying to book Volunteer for a day. I have sent an email but unfortunately it failed to go through. Does anybody have correct email or any other form of contact? Would really appreciate any advice Cheers from Jenny from Australia. As I know, now the volunteer program is only available at Dujiangyan Panda Base, you may drop them an email to pandaeducatecenter 163.com to make a reservation or call them at +86-28-69290315 for more information. I have booked for April and can't wait! To book you will need to complete an application form and your doctor fill in the medical form. Its in English and was easy for me. 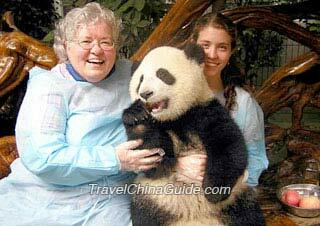 Can I book to hold a panda directly with Dujiangyan Panda Valley and not go through a tourist agent? Yes, you can make reservation of holding a panda directly with Dujiangyan Panda Valley. You can contact them at pandaeducatecenter 163.com for more details.